Congratulations—you signed up for your first yoga class! Not sure what to bring? Here’s a list of seven essentials to cover all the bases. So you joined ClassPass and decided that you’re finally going to try yoga. You asked a few friends to recommend a studio and signed up online for your first yoga class. You’ve carved out the time, you’re committed, and you’re ready. But now you’re probably wondering… what on earth do I bring? Well, look no further. Below are seven must-haves to bring to your first class to ensure you cover all your bases. Read through each one carefully, as they not all apply to you. Then, pack your gym bag and hit your new (and hopefully soon-to-be favorite) yoga studio. Put your cell phone on silent when you arrive and tuck it away in your bag. This is one journey you won’t be needing it for. This may seem obvious, but many people new to this practice don’t always know what to wear. But all you really need is something you can easily move your body in, like flowing pants and a supportive top—whatever will allow you to be comfortable, rather than self-conscious. At the same time however, you’ll want to practice in clothing that stays put, too, because if you’re constantly adjusting your shirt or pants and worried about a wardrobe malfunction, this can take you out of the zone or “flow” of the experience. Many studios sell water bottles, but you can’t always guarantee that this will be the case. Smaller, community-oriented studios may not have the resources to provide water at all, save what comes from the bathroom faucet. If you’re particular about your water and it’s important to you that it’s clean and filtered, then definitely bring your own reusable bottle and fill ‘er up beforehand. If you pick up a bottle at the store, bigger is actually better. One of those tiny, 8-ounce bottles may SEEM like a good idea at the time—especially if you don’t want to carry around too many things—but it’s simply not enough H2O. Staying hydrated during and after your practice is crucial to replenishing your body of lost fluids. Not everyone makes hydration an all-day habit, and it can often be easy to overlook when we get busy. Tip: If you’re worried you didn’t drink enough water before your yoga practice, you could always pick up a coconut water for afterward, to revitalize your body with electrolytes. Again, most studios also provide mats, but there’s not a guarantee that one will be clean and ready for you to use it—especially if it’s a crowded, donation-based studio you’re attending. However, if this is your first practice and you’re wary of investing in your own mat beforehand, just show up to class about 15 minutes early to ensure you can rent a clean mat from the studio for a small charge, usually around two dollars. The truth about renting yoga mats, however, is that there is no way to know how diligent the studio is about cleaning and sanitizing them. There is indeed a good chance the mat has been wiped down, but if you’re wary of germs and other people’s sweat, then please proceed to the next item below on this list. Truth be told, just about any type towel will do if you’re prone to sweating profusely. Sweaty palms and feet can make practicing on even the stickiest of mats like a game of slip ‘n slide. Plus, as mentioned above, if you don’t yet have your own mat and are wary of placing your sensitive skin on a used one, an unrolled towel placed right on top of your rental should do the trick. A small hand towel to wipe your brow, especially if sweat starts rolling down your forehead and burns your eyes (hint: always bring one of these to a Bikram or hot yoga class!) will also come in handy. Lastly, there are many “yoga towels” you can buy at an affordable price (and cheaper than a high-quality mat) that have a grippy side on the bottom to help it (and you!) stay in place. Though we see many yogis cruising about town in designer yoga duds with a matching zip-up jacket, headband and mat carrier, not everyone is comfortable wearing workout gear in public. If you happen to fall into this category, own it—there is nothing wrong with you and this does not make you less of a yogi! Bringing a change of clothes can be as simple as grabbing a pair of jeans and a clean shirt, or rocking your yoga pants anyway with a cute tunic-like top. Because let’s face it—our lives are busy. If we find ourselves cramming an hour vinyasa class into a day that is already meticulously scheduled down to the minute, then there’s not always time to go home and change before say, heading out to dinner with friends. Bringing a couple of items with you for a quick presto-changeo can go a long way to carry you through the rest of your day. Worried you stink? Some studios have showers, yes… but you can’t always count on it. Douse yourself with some perfume, cologne, or your favorite essential oils, and rock that post-yoga glow! Depending on what time of day you’ve scheduled for yourself to practice, there is nothing worse than finishing a rigorous session and suddenly feeling like you’re so starving you might very well gnaw off your left arm. Rather than find yourself in a pinch, pack a protein or granola bar with you ESPECIALLY if you’re someone who suffers from episodes of low blood sugar. If you’re meeting a friend for dinner, tea, or drinks afterward (because you have your rockin’ post-yoga outfit packed and ready to go), it still can’t hurt to have something small on hand—like a handful of almonds—to help recharge your energy reserves. Sure, you can always grab a smoothie afterward, too, but make sure you’ve done your research prior and know whether there’s a place nearby. Last but not least and perhaps the most essential of all… the open mind is integral to approaching this practice for the first time. Without an open mind, we can be quick to judge the experience we’re having, judge other students in the room, and even judge the teacher. Many people come to yoga and beat themselves up before their first Downward Dog. They assume they’re going to be bad at it, that they’re not flexible or strong enough, that they won’t know what the heck they’re doing. Remind yourself that all you really need is the willingness to be with yourself in breath and body for 60 minutes, and whether or not you can keep up with the flow of the class or understand Sanskrit is irrelevant. Practicing yoga is about experiencing the sensations of the body by way of the breath. The end result is a clearer and more grounded, present mindset, which is exactly that post-yoga bliss that keeps us coming back for more. We don’t practice yoga just to get good at yoga… we practice to become the best versions of ourselves we can possibly be. And if a little strength and flexibility comes along with it—well, then that’s a bonus. Andrea Rice is a writer, yoga and meditation teacher, and Wanderlust Festival presenter. Her articles and essays have appeared in The New York Times, Yoga Journal, The Wanderlust Journal, NY Yoga + Life, mindbodygreen, and SONIMA, among other publications. She has been teaching yoga since 2010, first in Brooklyn and Manhattan, and now in Raleigh, NC, where she currently resides. She is also co-authoring a book about the application of seasonal rhythms and yoga philosophy to modern life, which will be published by New Harbinger in early 2020. 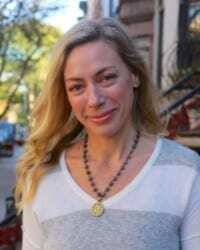 Connect with Andrea on Facebook, Instagram, and Twitter, and sign up for her quarterly newsletters on her website: www.andreariceyoga.com.